"1957 - Solid Wood and Iron Award Plaque - Rotary Club - Winter Park, Florida." (1533) 1957 - Solid Wood and Iron Award Plaque - Rotary Club - Winter Park, Florida. - Condition: Very Good. 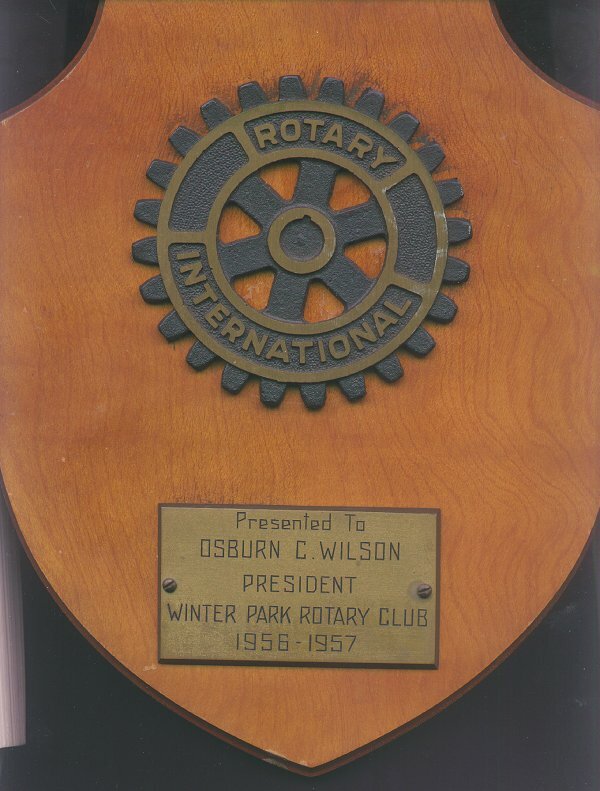 Beatiful solid wood plaque with iron additions showing the Rotary International Symbol at the top in gold and black iron, and a metal plate at the bottom with the following information: "Presented to Osburn C. Wilson, President, Winter Park Rotary club, 1956 - 1957. Plaque measures 9" by 11". Mr. Wil- son was principal of Winter Park High School from 1950 through 1968. Born in Kathleen, he moved to Central Florida in 1949. He was also past president of Winter Park Rotary Club from 1956 through 1957, principal of Ocala High School from 1948 through 1949 and a member of Rotary Club International and Florida High School Activities Association. He was also a retired Air Force colonel. NOTE: **Scan does not show sides of plaque**. Price: $28.00 + shipping.